The last time I made soup in my slow cooker was in the second year at university. On Saturdays I worked in a well-known high street retailer of magazines, books, stationery and music. After I had finished selling Daniel O'Donnell CDs and saucy lady magazines (always sandwiched between a gardening and classic music magazine) to the good people of Southampton I would stroll back to my flat and pick a can of soup for my Saturday dinner. Every other day I would cook myself something from scratch but Saturday night was tinned soup night. One Saturday however I decided to make myself a potato and garlic soup before I went to work and leave in the slow cooker to be enjoyed by myself upon my return. Oh the joy of not even having to get the get the tin opener out and putting my bowl in the microwave for a couple of minutes! All day I looked forward to this soup feeling smug in the knowledge that a warming, tasty and filling dinner would be ready for me on my return. When I did get home I was confronted by three angry flatmates and an overwhelming garlic stench. It seemed that while I was ensuring I left university debt-free they were awoken from their slumber by the smell of my dinner cooking and as the day went on it got stronger and stronger. I did taste the soup and with my best food critic's hat on I condemned it as 'foul'. Perhaps it was one too many a garlic clove in it...I have searched through my student recipe folder for it but sadly it seems lost to history. With such a sorry tale to tell about my soup making it's probably no surprise I have shunned my slow cooker when I have made it since. However, this changed when I was flicking through the copy of Mrs Beeton's Household Management I was given for Christmas. Whilst I was amusing myself with the thought of making turtle or calf's head soup (both out of stock at my local supermarket it seems) I came across two recipes for carrot soup. Both of them needed to be cooked for ages which made me think this would be perfect for making in the slow cooker. The first recipe required 4 quarts of liquor for just 6 carrots, 2 onions and a turnip. I found this equated to about 8 pints of stock which could only make some very watery broth with a bit of veg floating in it. So I raided my fridge, of which the contents is listed in the ingredients before, added some stock and of course coriander. The main ingredient is obviously carrots but a variety of veg can be used depending on what you have available. I've billed this soup as being vegan and gluten-free. Obviously if you are following a vegan or gluten-free diet you will be aware of what ingredients you can use. However for other people some ingredients such as vegetable stock if you make it up from a cube can be a bit of a minefield. There are vegan and gluten-free stock cubes available in supermarkets but you may need to search through the ingredients list. 1. Pre-heat the slow cooker on HIGH while you prepare all the vegetables. 2. Put all the vegetables, stock and dried coriander leaf into the slow cooker. Season with black pepper. 3. Cook on HIGH for 4-5 hours. 4. Remove the pot from the slow cooker base and put on a firm surface. The vegetables should just look as it they have been cooked. 5. Using a hand blender on pulse blend the vegetables until you get the consistency you require. 6. Check the taste and see if it requires any more seasoning. 7. Either serve immediately or chill and reheat when required. I can't believe I was too late for the No Croutons Required challenge! I love the thought of your new Slow Cooker challenge because as you can see it's been part of my weekly cooking since I was at university. That's quite a list of challenged ticked off - well done - the most I've seen. A wonderful entry for Simple and in Season, thank you. It took me more time to link up and put the badges on than it did to write the rest of the blog post! All the challenges just seemed to fit so well this month. Sounds yummy and wonderfully warming. And serves to remind me I must be the only food blogger who doesn't own a slow cooker, something that really must be addressed! Thanks so much for entering Four Seasons Food. You must get one! At this time of year especially it makes cooking so easy and kids love things which are cooked in some sort of sauce or stock. A FABULOUS entry for Cooking with Herbs and such a tasty recipe too! 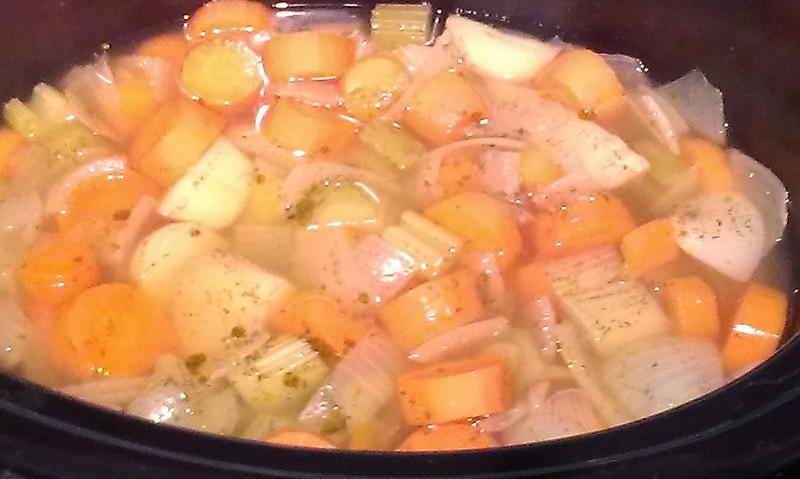 I've never tried cooking soup in a slow cooker before, but I really ought to start! Sounds like a fab idea for working parents. Thanks for sharing with the No Waste Food Challenge! It's so easy because you can leave it without worrying about leaving a pan on the hob. Also very useful with young children about! I like the use of coriander in connection with the carrots here. I just wonder if I can achieve similar results without a slow cooker. My father makes soup a lot and I have just asked him! He says bring the vegetables to the boil and then simmer them for 30-45 minutes before blending.